In larger cities, you may find the occasional Starbucks, but chances are more likely that you’re going to be grabbing your java at small, local cafés, which, by the way, is always going to be a better bet. You didn’t travel all the way to Europe for coffee you can get at home, right? Of course not: You’re in France to enjoy some joie de vivre. 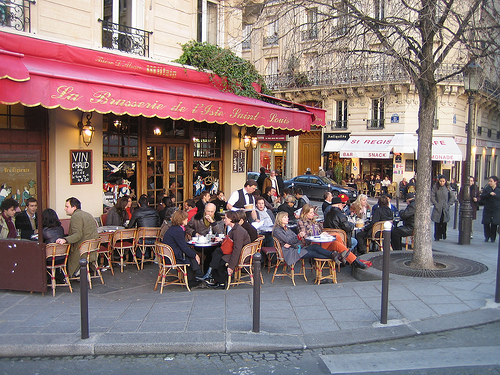 To find the simple pleasures for which France is so well known, you need look no further than the corner café. There are a few things to know ahead of time, so that you can make the most of the experience. After all, we know how to drink coffee when in Rome, as the saying goes. In this case, however, you’ll want to order and enjoy your coffee like a local, or comme un Français. When it comes what you order, you already know it’s important that you understand your options (and as in Italy, only order milk with your coffee after breakfast if you don’t mind braving the mildly disapproving glance of your server). What to do with your coffee once you get it? Do you grab it to go? The short answer is no. There are a few cafés that now offer and advertise café à porter (coffee to go), but it’s not very popular and you won’t see many, if any, people wandering around with a paper cup. Navigating life one-handed for the sake of a speedy coffee on the go is a distinctly North American habit. Whether you’re standing at the bar or sitting down, you pay after you finish, unlike home where you buy your coffee first and then enjoy it second. Some cafés will have different prices depending on where you sit (indoor, outdoor, or at the bar). Oh and, in France, you won’t need to ask for sugar (the French do love sweet things); the sugar cube will accompany the coffee, often along with a little square of chocolate. Grab that sugar cube and you can make like a local and faire un canard (un canard means “duck”): Quickly dip (like a duck) the cube and then nibble the coffee-soaked cube before it dissolves. C’est si bon, n’est ce pas? À la prochaine!